Build Your Future in Aspen Heights by Arranging a Private Appointment. 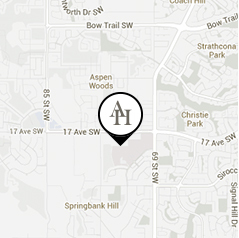 Aspen Heights is located in the desirable community of Aspen Woods at 88 Aspen Ridge Heights SW.
Travel west on 17th Ave SW. Turn right on 73rd Street SW and left onto Aspen Ridge Heights SW.
Travel east on 17th Ave SW past 85th Street SW. Turn left on 73rd Street SW, then left onto Aspen Ridge Heights SW.
Travel south on Sarcee Trail SW. Exit to 17th Ave SW. Travel west on 17th Ave SW, turn right on 73rd Street SW, then left onto Aspen Ridge Heights SW.
Travel north on Sarcee Trail SW. Exit to 17th Ave SW. Travel west on 17th Ave SW. Turn right on 73rd Street SW, then left onto Aspen Ridge Heights SW.